I’ve a had a few Raspberry Pi Zeros lying around projectless for a while now — they’re just so inexpensive and I love the idea of a tiny cheap computer, so every time there’s a new revision I pick one up at Microcenter. I have an original 1.2, a 1.3 (with the added camera connector) and a Pi Zero W with integrated wireless and bluetooth. Back when I first started fiddling with the Pis, I bought a few RGB LEDs, but couldn’t get them working right. I’m sure it was a combo of not having the appropriate resistors and user incompetence. 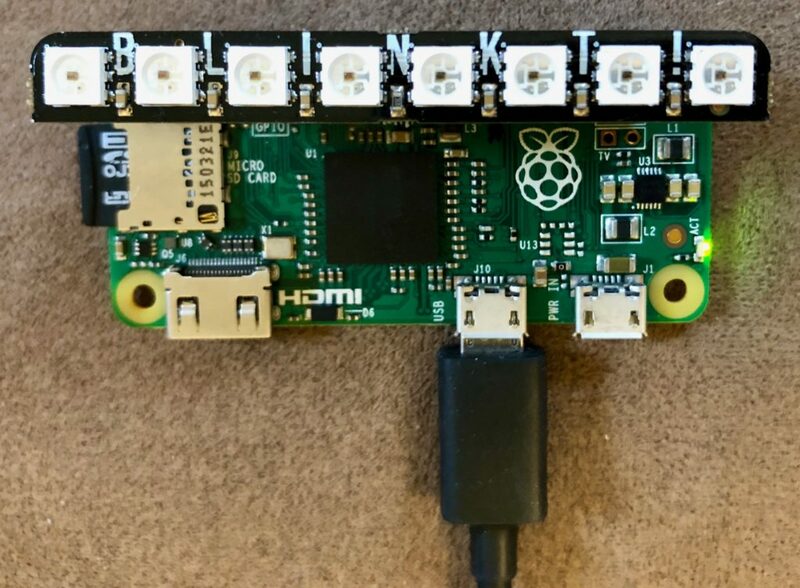 I was in Microcenter the other day, and while they did not have a new Pi, they did have a Pimoroni Blinkt: Pre-soldered headers, and 8 individually addressable RGB LEDs with a Python library. The Blinkt actually fits within the footprint of the Pi — it only looks like it’s overhanging on the sides here because it’s sitting up very high. I have a female header on the Pi and the Blinkt comes with a female header, so there’s a connector in between, making the whole thing about 3/4″ higher than the surface of the Pi. After plugging it in 1, I installed the library to the Pi. It comes with a bunch of examples to get you started. It’s super-easy to light up a pixel: set_pixel(pixel,r_value,g_value,b_value) for whichever pixels you want to set or update, then show() to send the command 2. Then I had to decide what to build. I’m not too interested in notification things, like new messages on Twitter or Facebook or new emails or whatever. Those are pretty much on or off, and additionally would require tying into multiple services. Weather seemed interesting. I’d looked at the Dark Sky API before. There’s a lot of complexity there: Temperature, precipitation, wind, humidity, visibility, clouds, etc. plus looking at current conditions, future conditions, or even past conditions. Eight LEDs isn’t that many. I wanted to build a status-board type app — no user input (aside from location). But I also wanted to do more than just display current conditions. I settled on having a number of “screens” the app would cycle through, each displaying a different type of information. I only make use of a max of seven LEDs per screen, leaving one to indicate which screen you’re currently viewing. Current conditions — displays current temp, low and high in the next 24 hours, and precipitation probability for the current day. The display cycles between each screen on a two-second delay. It updates its data from the Dark Sky API every five minutes (probably overkill, but the API gives you 1,000 calls per day for free). For the temperature displays, I have a scale of < 0° (purple), 0-32° (blue), 32-50° (light blue), 50-65° (green), 65-80° (yellow), 80-95° (orange) and > 95° (red). I’ve also decided to use apparent temperature rather than actual in all cases. Example at left. For the precipitation, I have < 25% chance (green), 25-75% chance (yellow) and > 75% chance (red). Example at right. The indicator letting you know you’re looking at current conditions is white, seven-day low temp is blue, seven-day high temp is red, and seven-day precipitation is green. Given the need to clearly indicate which screen you’re on, I’m not sure how many more I’d be able to add without being confusing. Unfortunately our weather here in St. Louis isn’t terribly variable at the moment, but here’s a walkthrough of the current displays nonetheless. These are all diffused through an index card as it’s difficult to take a photo of the LEDs directly. The display just cycles through the following four screens. The current conditions are: Current temp, 24-hour low and 24-hour high all between 0 and 32°F, and a 25-75% chance of precipitation today. You can see the status indicator light at the far right (it’s white, though it looks blueish in the image). Pretty simple to read this one: 0-32°F lows all week. Blue status indicator. Hey, something different! On Thursday, the high temp will be between 32 and 50°F, and on Friday it will be between 50 and 65°F. Red status indicator. Here’s the 7-day precipitation forecast. 25-75% chance of precipitation today, Tuesday, Wednesday and Saturday. Less than 25% chance Monday, Thursday and Friday. Green indicator. First, we’re importing the necessary packages, including blinkt to control the LEDs and requests to access the API. The status_colors variable is a dict of the screens and their associated indicator colors. The next two functions tell the script to clear out all the lights when the program exits, and to set the default brightness of the LEDs to the minimum (you can control the brightness individually when you set the pixel, though anything more than the minimum is very bright. interval and delay are about timing, but different things. interval determines how long to wait before getting a new update from the API. As written, the program makes a new call every five minutes. The Pi Zero doesn’t have a real time clock, so if I need the actual time I have to sync it from the Internet somewhere. But I realized I don’t actually need to know real time, only elapsed time. So I get whatever time the Pi thinks it is when the program starts (cur_time = time.time()) and then just check how much time has elapsed to see if I need an update from the API. delay determines how long to pause on each screen. Right now it’s set at two seconds, which is probably as quick as I’d want it to be. A touch slower might be better. Next is a loop that runs continuously while the program is running. First I have to determine whether or not to hit the API for a new forecast. I need to get a new forecast whenever I either don’t have one at all (e.g. the user has just started the program) or if it’s out of date. So the first condition (line 112) just says if both of those conditions are false, I don’t need a new one. Pretty straightforward. The API has a few optional parameters, but a basic call like this gets everything. The function returns the json response. This takes the entire forecast returned by the API and whittles it down into just the datapoints that I need. First I create a dict with no data in it to clear out any existing data. Next I get the seven-day forecasts for low, high and precipitation, creating a list for each measurement. Finally I work on the current conditions. I decided to display the current temperature, the low and high for the next 24 hours and the current day’s precipitation probability. So I set all three values equal to the current temp, then loop through the first 24 hours and update the low or high value whenever I find one that’s lower or higher than the one already stored. I may decide to do the same thing with the precipitation probability. As it is now, the “current” screen just shows the current day’s chance of precipitation, which isn’t that useful at 10 p.m.
Then after I’ve updated the data from the API and prepared the data, I update cur_time to the current system time (line 117), so I won’t check the API again until the interval has passed. Now, on to displaying the data! blinkt.clear() is part of the blinkt library that sets all the pixels to nothing. This just ensures that nothing carries over from the other screens. Next, I set the status indicator. This uses the status_colors dict to get the color, and blinkt.set_pixel() to set the last pixel to the color (in this case, white). Pretty simple there. For precipitation, I decided to go with buckets of less than 25%, 25-75% and greater than 75%, showing green, yellow and red respectively. I’m only using four pixels, plus the status indicator on the current screen. Once I have those all set, all that’s left is to call blinkt.show() to update the display. Again I clear the pixels of their previous values and set the status pixel. Next is simply stepping through the list of temperatures, getting the correct color with getTempColor() and setting the pixel. After I’ve done all that, I call blinkt.show() to update the display. This is almost identical to the temps function, except it calls getStoplightColor() instead. And that’s it — the program just cycles through that while True loop, updating the data from the API as necessary. The full code is available at this Gist. Overall, the Blinkt is really easy to work with, mostly due to the library it ships with and the fact that there are only 8 LEDs to manage. It can be tricky to get the LEDs to display the color you’re looking for — adjusting yellow to be distinguishable from orange, for example. The brightness is also tricky to manage — brighter colors are easier to differentiate, but a white pixel at full brightness is painful to look at unless you’re using a diffuser of some kind. If you want to mount this permanently with a diffuser, you’d probably want to modify the code to account for it. In conclusion: It’s a fun project with lots of opportunities to continue hacking on.